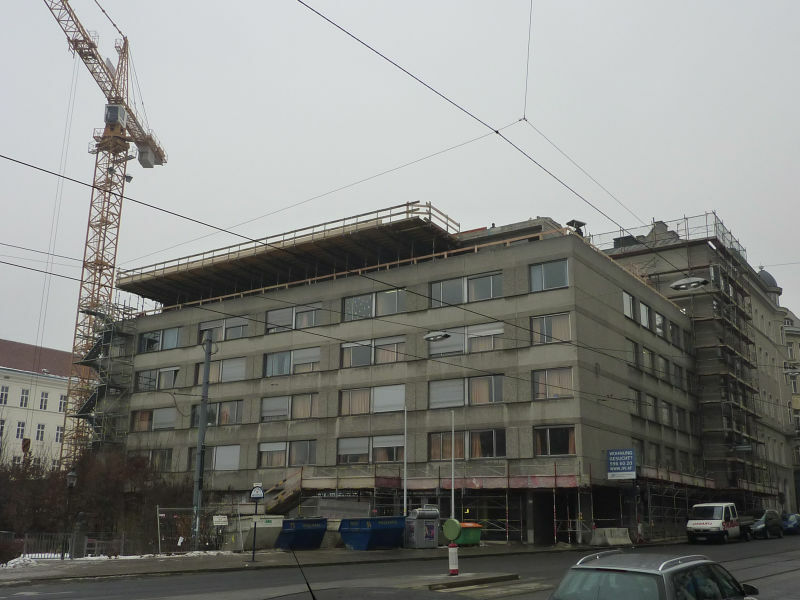 In Austria, Lerchenfelder Straße 1 - a dormitory initially built in the 1970s - is an up-market location in today's Vienna. Thanks to its slightly elevated position and the Weghuberpark in front, there is an outstanding view of the city center nearby. 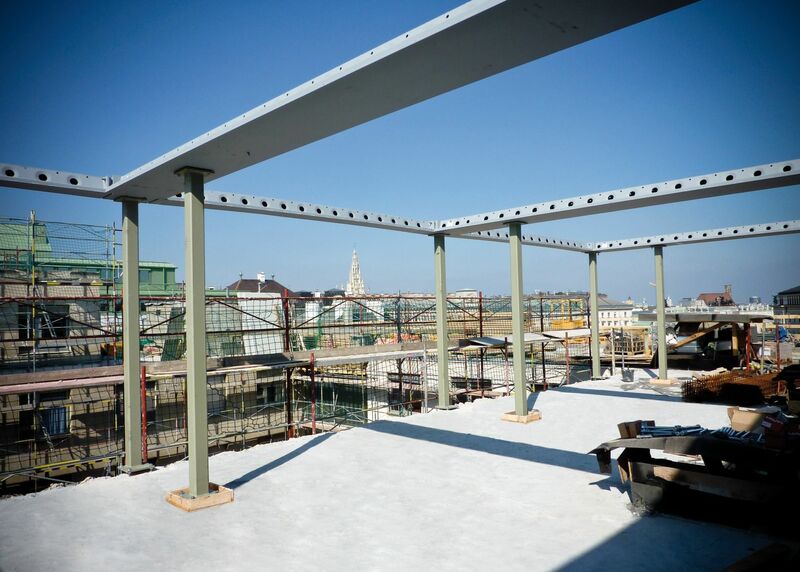 In two construction stages, the building is to be initially increased by three stories and subsequently renovated into a hotel. The DELTABEAM® Composite Beams provided by Peikko were used for the structurally demanding construction work of the new floors, making the building's construction exceptionally light. The dormitory is located in the vicinity of Vienna city center next to Weghuber Park, near Mechitaristengasse and Lerchenfelder Straße. The property is divided into two parts: an old building listed for preservation in the Mechitaristengasse and a new building constructed later. There is also an underground parking lot at the property. 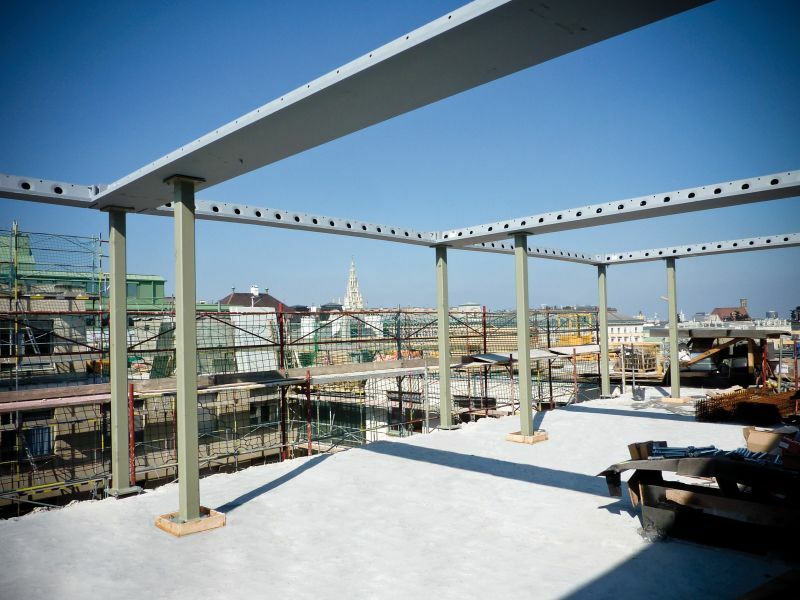 The property is being expanded by 2,500 m2 by adding three floors to it. The new floors will be used as a boarding house where some 30 furnished apartments will be available for short-term rent. The dormitory will continue to operate whilst the building work is going on. 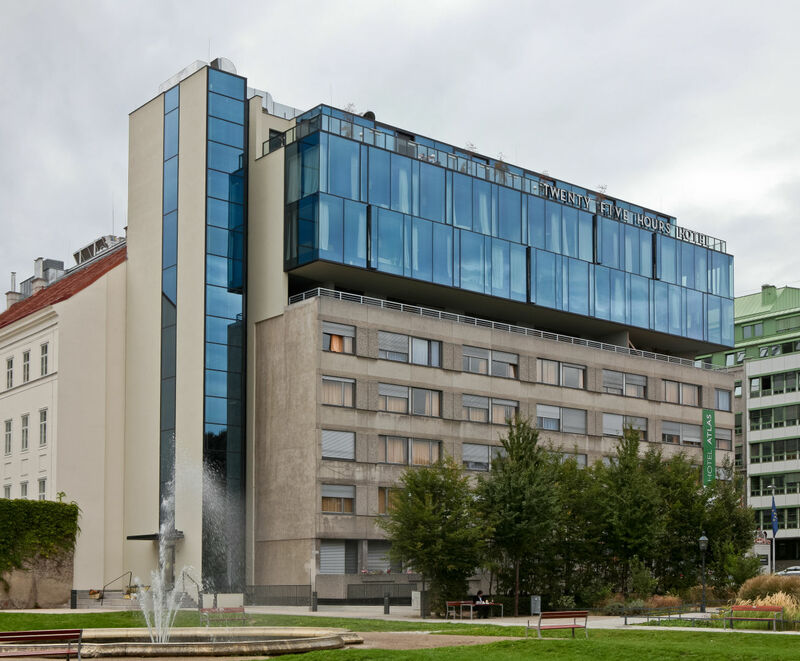 Once the additional floors have been built, the property will be converted into a two or three star budget design hotel with approximately 190 rooms. The premises will also house a modern conference area and a spa. The constructor of the site, Strabag AG, is applying contemporary and modern architectural solutions in every detail of the building. Michael Schügerl, engineer and responsible construction supervisor at Strabag AG, the general constructor at the site, listed the multiple challenges of the project. 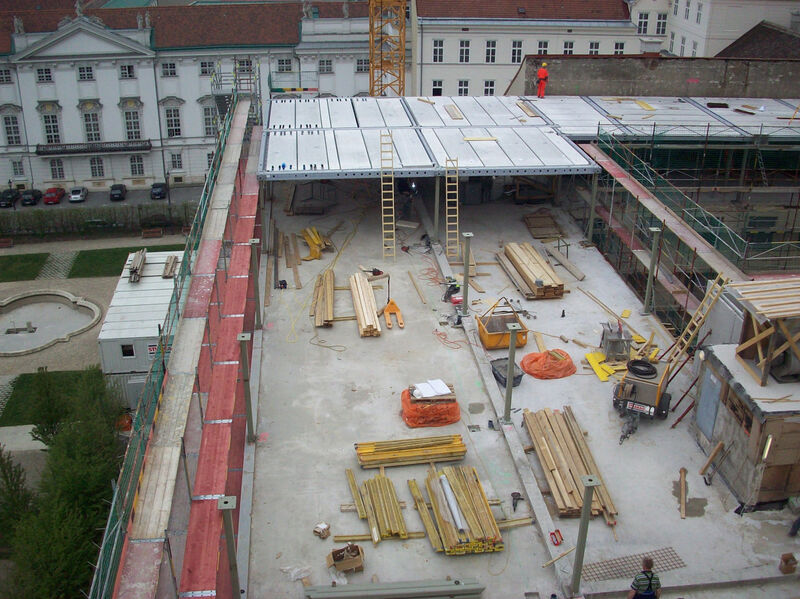 Not only does the ongoing operation of the dormitory make executing the building work more complicated, but the location of the site also means overall logistics at the site must be managed in an the extremely narrow space with as little distraction as possible to the busy Lerchenfelder Straße. There is only one unloading zone for supplies, where the head foreman Rudolf Rebensteiner must follow strict timelines and schedules. An efficient progress in the construction work can only be ensured under these conditions. It was also required to finish the glass façade by the end of June and the release the building of the scaffolding. 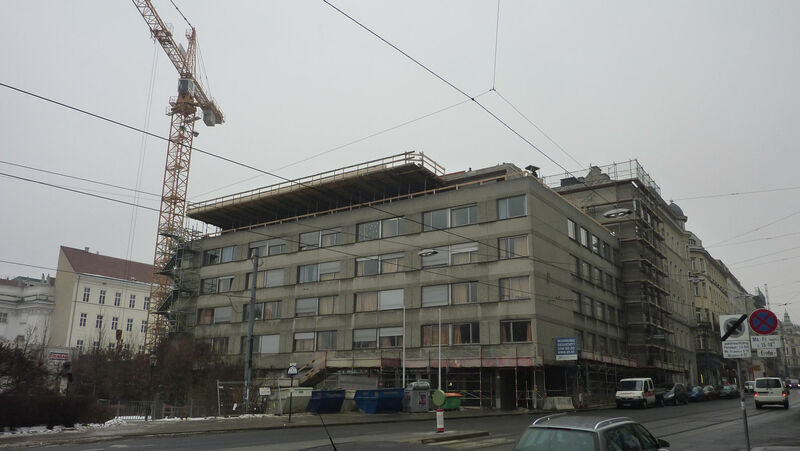 In the run-up to the construction work, the commissioned structural engineer, Prof. DI Christian Aste from Aste Konstruktion at Innsbruck, examined the existing building fabric and did not identify any building defects. 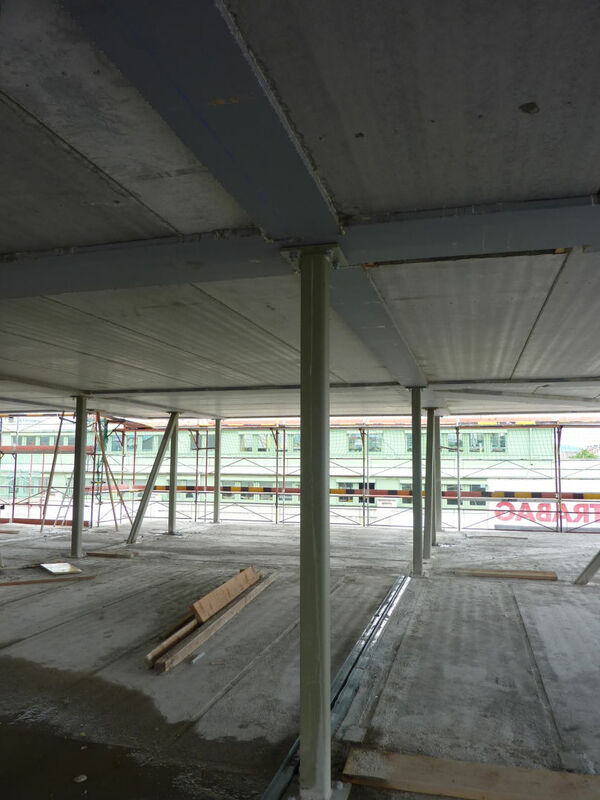 The structural challenge of the project was, of course, not to overtax the existing foundations through the planned addition of another floor. In the light of the specific framework conditions, which severely hampered reinforcements in the foundation area, the conversion could only take place through a fundamental minimization of additional load. Prof. DI Aste solved this challenge by adding slim composite steel construction and massive ceilings with hollow core planks to the building. Despite the massive design and attainability of the R90 quality, the largest weight saving possible could be attained through the hollow core planks. The load carrying system was planned as a composite steel construction with very high requirements. 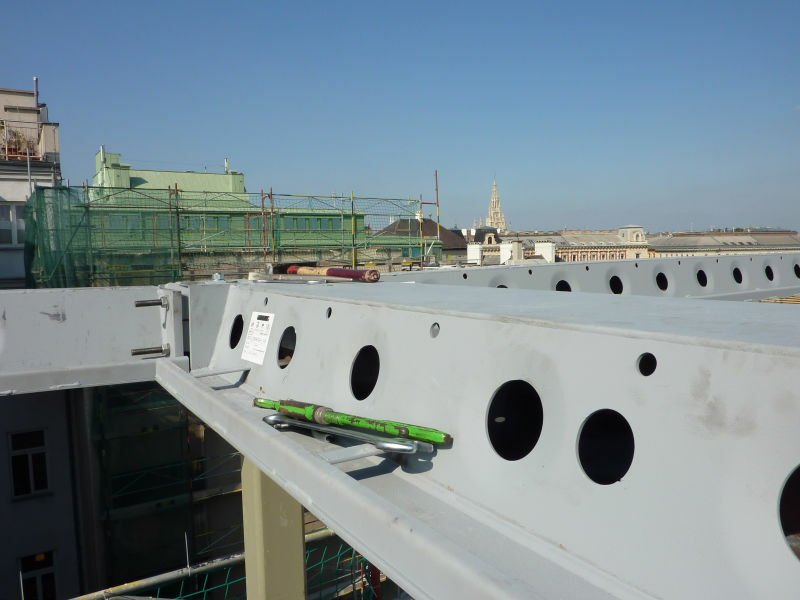 The weight advantage of this slim construction lies in contrast to the low number of bracing points available. The horizontal plate effect must be available so that the overall construction can work. Another structurally interesting detail is the form of a five meter long projection on the existing final ceiling over the fifth floor. In the final state, this will function without support as a suspended projection fastened to the steel construction via slanted supports, integrated into the walls. Considering the requirements, the use of the DELTABEAM® Composite Beam from Peikko proved to be an ideal solution. 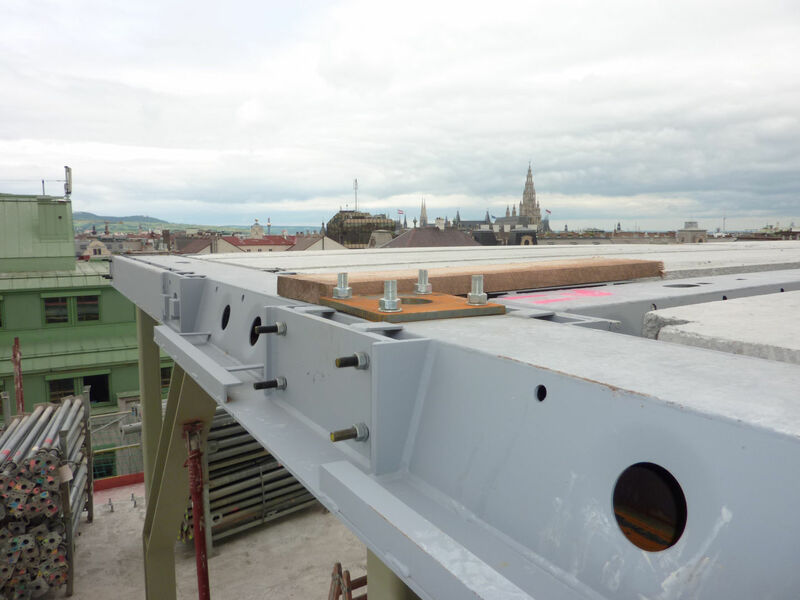 The overall horizontal load carrying system with DELTABEAM® was calculated in the face of previous plans for creating the overall steel construction of rolled sections and submitted to the building authority. The vertical steel construction remained as a composite construction with forming tubes filled with concrete. 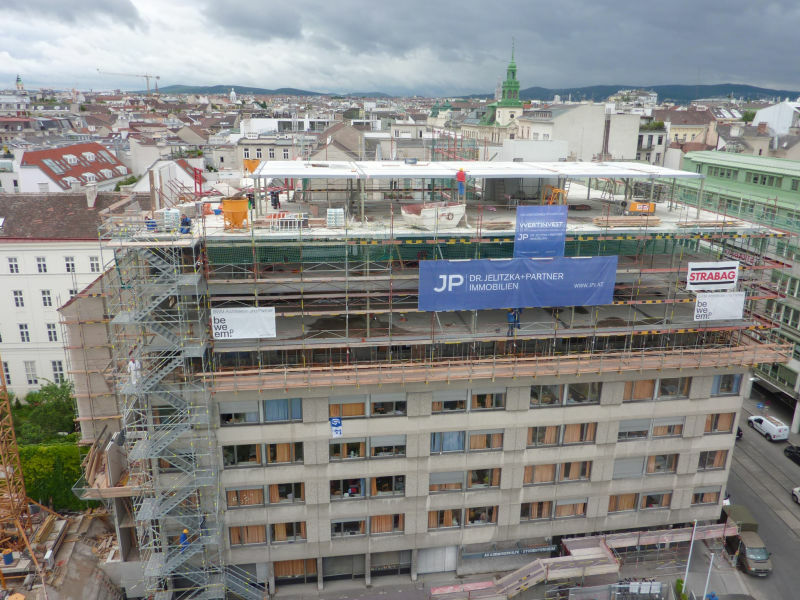 The building authority of Vienna recognized this composite construction in R90-quality as such and the bidding could begin. 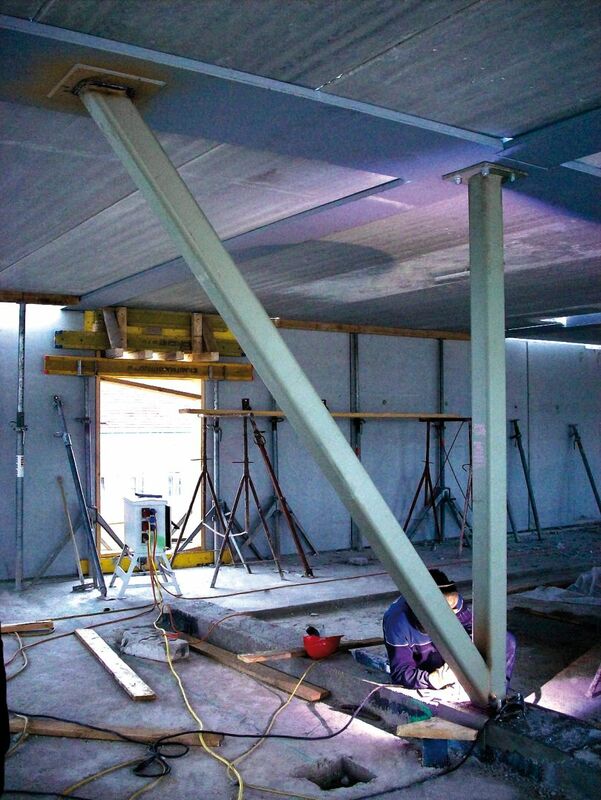 The DELTABEAM®s were above all satisfactory in the following points: R90 fire resistance without additional fire protection, low height and weight of the ceiling construction, erection of the overall ceiling construction without temporary supports, potential for support grid creation and short assembly times for the steel or ceiling construction. In addition, the different beam spans were optimized through different sheet thicknesses, at uniform foundation engineering height. R90 Fire Resistance In low floor heights the possibility of internal fire reinforcement is certainly a great advantage of DELTABEAM®. DELTABEAM® has a patented trapezoidal cross section that bears the hollow-core planks without protection plates in case of a fire. The loss of lower flange strength caused by the fire is absorbed by internal reinforcement. The DELTABEAM® is therefore also considered to be R90 fire resistant without additional fire resistant coating. 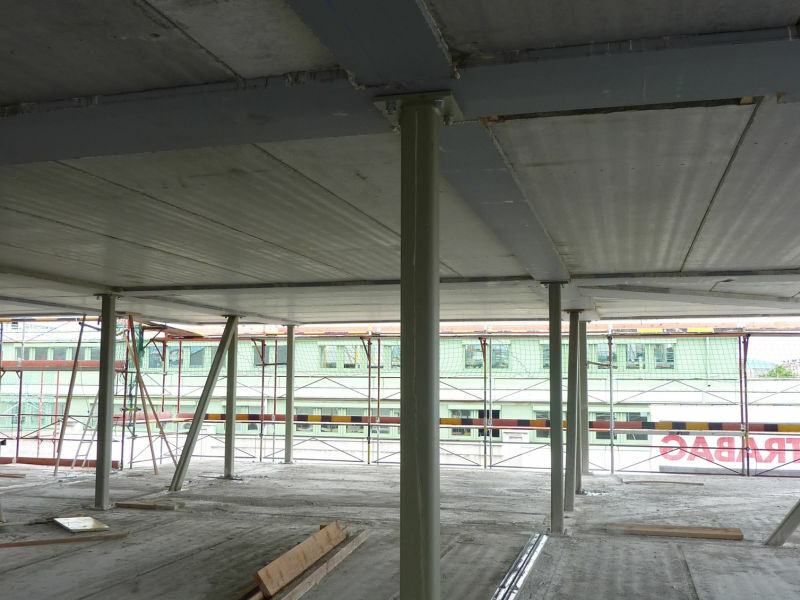 When another floor is added the weight and the height of the construction must be kept in a minimum - a task that affects the construction of the ceiling. 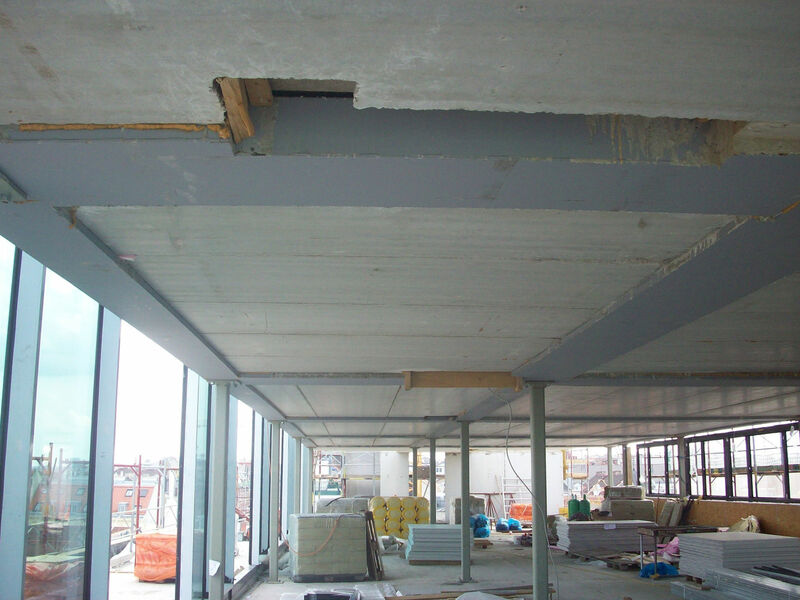 The weight of the construction has been reduced by the use of hollow-core planks in comparison to in-situ concrete ceiling, since the existing foundations could only be reinforced to a limited extent. 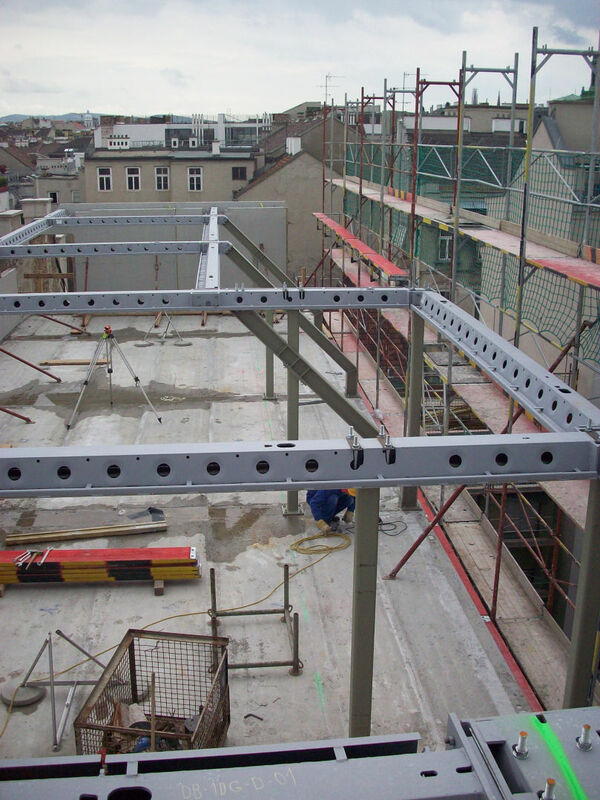 Low heights were employed with a 16 cm hollow-core plank and a 20 cm high DELTABEAM®. Since in this project the addition of another floor started in the sixth floor and the remaining floors were in full operation during the construction phase, there could not be any ceiling load in the existing final ceiling. Constructing by using DELTBEAAM can fulfil this condition. 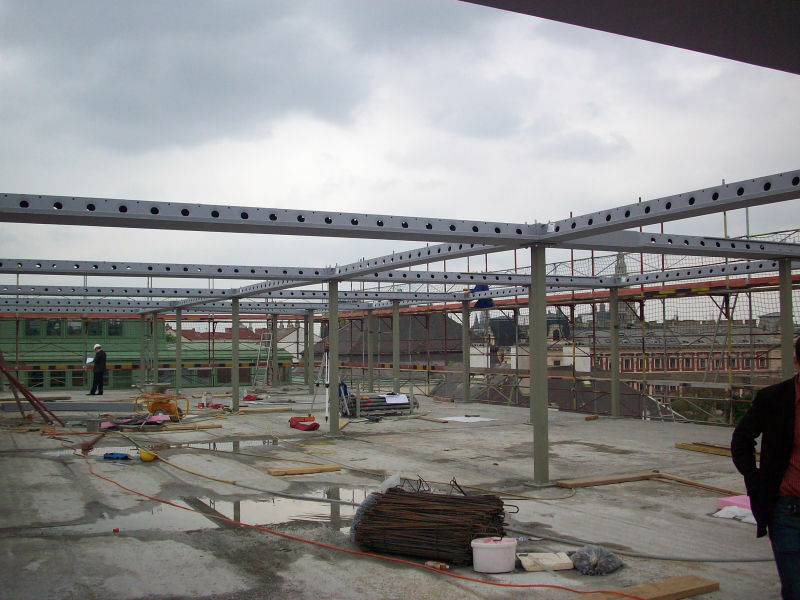 The overall construction of the ceiling including the hollow-core planks can be erected without support. When the hollow-core planks were laid the finishing could be started. The overall construction remaining was fixed simply by using bolted connections, which is usual for a DELTABEAM® construction. 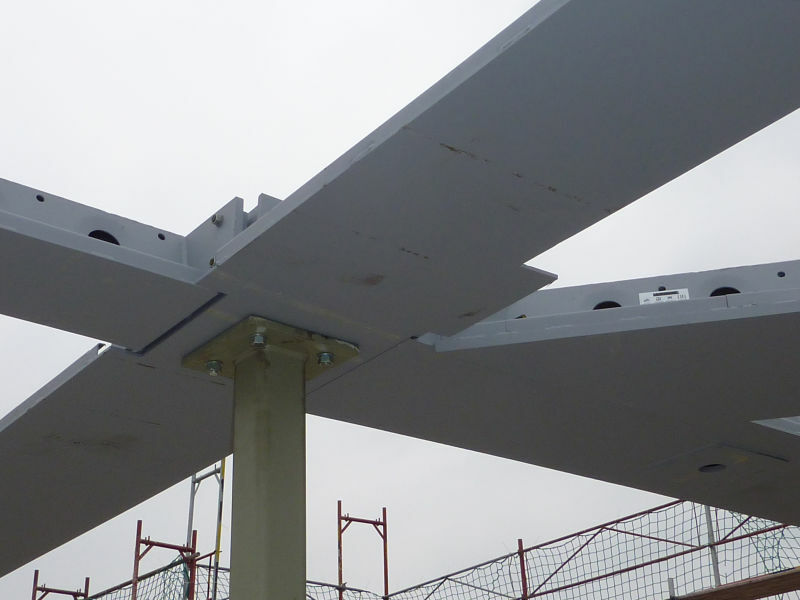 To achieve the rigid plate necessary, the side end beams and the central beam were formed via bolted-in connectors as a support grid in addition to the wide main beams. When filled with concrete, the support grid - including the concrete core and the hollow core planks filled with concrete - act as a stiff plate, and in this way can support the horizontal forces in the reinforcement core. 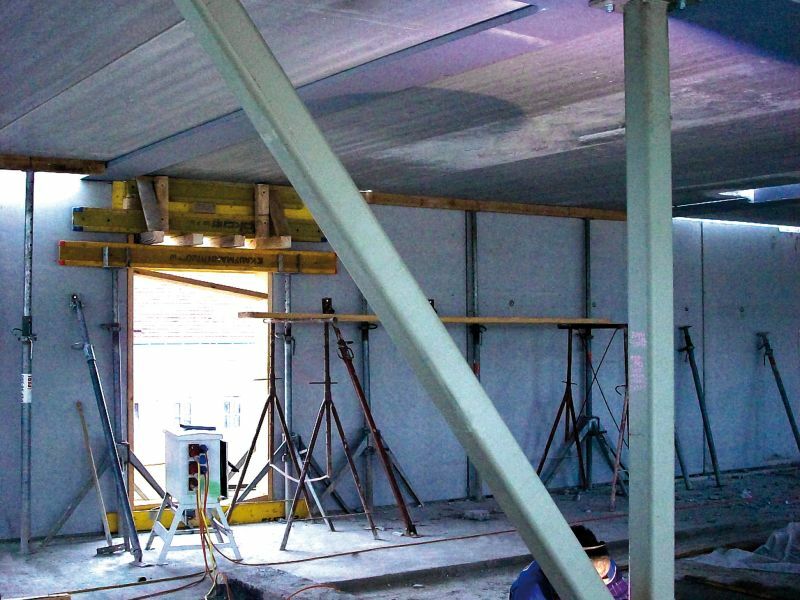 The cooperative action of the cavity walls and the DELTABEAM® also takes place via anchors, which were set here in concrete with the grouting of the beams. 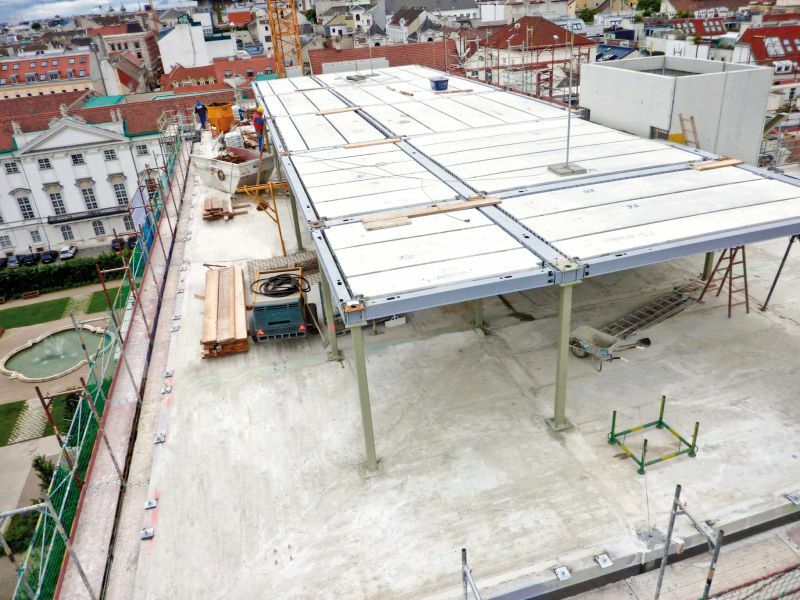 When formwork costs are high, prefabrication close to 100 per cent comes with huge advantages. 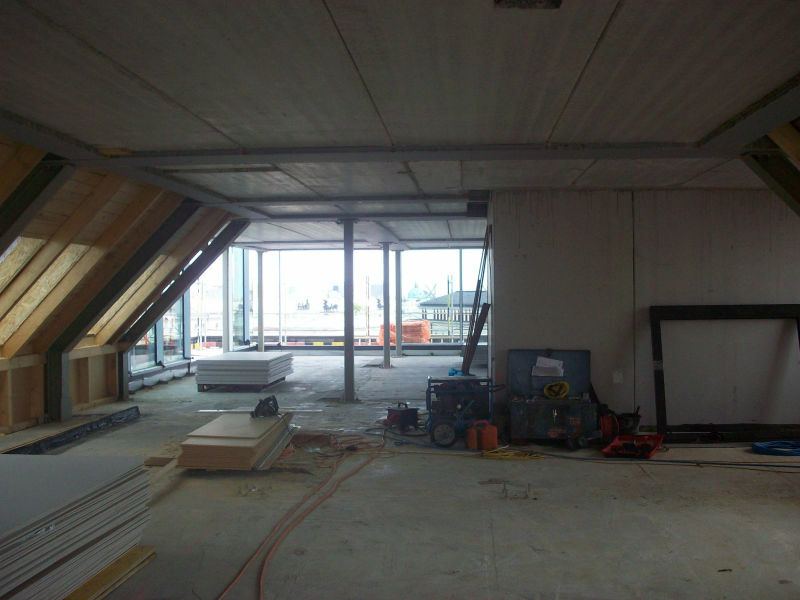 The walls used were of prefabricated double shell elements, so hardly any formwork preparation was necessary on-site. The necessity of quick assembly does not even need to be mentioned. Prefabrication is an advantage here and can cut down on assembly time. 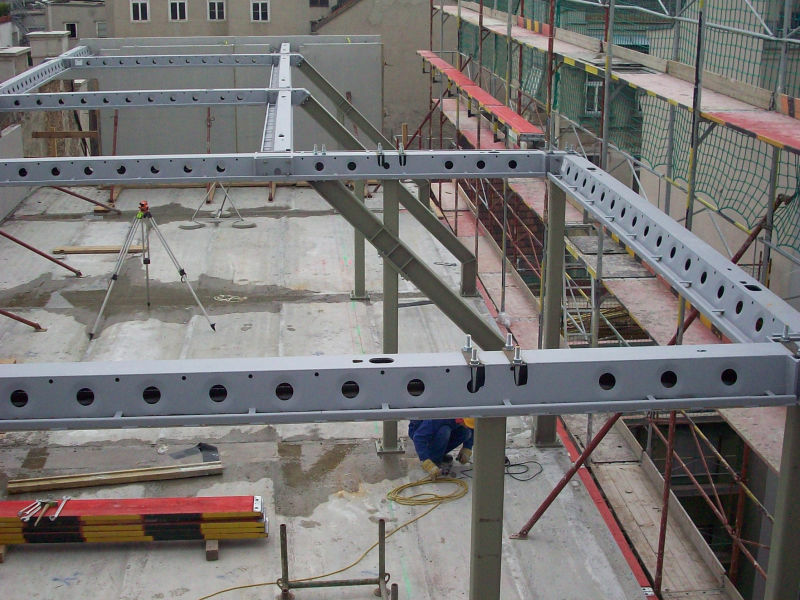 However, using prefabrication requires thorough planning when used for property reconstruction. 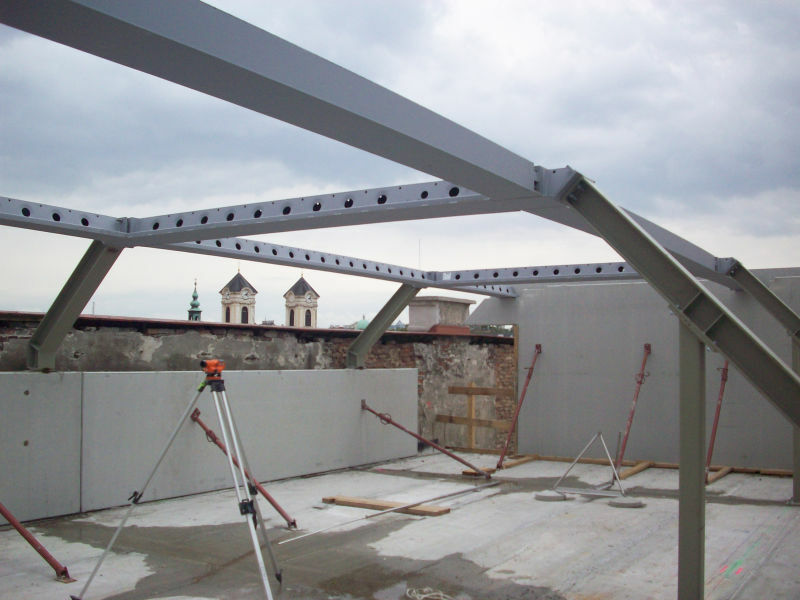 In this renovation project, DELTABEAM® Composite Beams and exemplary use of prefabricated elements were a real problem solver.